The US elections, taking place as I write, have not been much on the radar screens in the parts of Indonesia I’ve been in lately. Unlike the Indonesian elections, which are not due until 2014. Dashing out in front of the pack is Prabowo Subianto, a Suharto clone who is not, actually, a presidential candidate yet, according to his office. On the back, logos of his Gerindra political party, pictures of the local party bosses, and: “FREE”. The ambulances are strategically places in front of the tomb on the one day a year when thousands of pilgrims, mostly farmers, troop around tombs of the nine saints buried around Lombok. I ask one woman why she thinks the ambulances are there. “Prabowo wants to keep us safe,” she says. No doubt. He has recently topped a national poll as the most popular (non) candidate. His party, Gerindra, is without doubt the best disciplined of Indonesia’s pack of over a dozen. And he is especially popular with people who grow misty-eyed at the mention of Suharto, Prabowo’s former father-in-law. The English cliche used to describe the man who ruled Indonesia from 1965 to 1999 is “strongman” but misty-eyed Indonesians follow the name of Prabowo with “Tangan Besi” “Iron Fist”, then a series of approving nods. Prabowo’s particular genius is for leaping into bed with his enemies. In 1996, he trained the thugs that tried to oust Megawati Sukarnoputri from the leadership of the PDI party. In 2004, he ran as Megawati’s Vice Presidential candidate. As a Kopassus commander, Prabowo was a key figure in the battle to suppress what was then called the “Security Disturbing Movement” in Aceh, and is accused of human rights abuses there and in East Timor. Earlier this year, he became one of the former Disturbers’ greatest political supporters, stumping up 50 billion rupiah for the Partai Aceh campaign, according to political rivals. 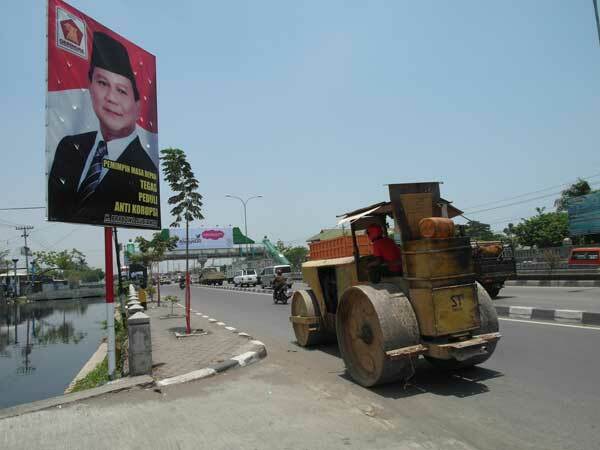 That’s five million dollars; the sum may just be pre-election bad-mouthing, but it is beyond doubt that Prabowo was welcomed as a guest of honour at the inauguration of his former battlefield adversaries. And that he has a special interest in the support of Partai Aceh, which, as a local party with a formidable grass-roots machine, has no candidate of its own to back in 2014. Prabowo has the distinction of having been denied a visa by the US, under the provisions of the United Nations Convention against Torture. But he doesn’t often make it into the UK papers. An exception, yesterday, was the report in the venerable Financial Times that Nat Rotshchild is cozying up to the Iron Fist. The story of Bumi plc is too torturous to relate, but Nat’s principle seems to be that the enemy of my enemy is my friend. He wants to buy the Bakrie family out of the floundering coal buisiness, and Aburizal Bakrie is a rival (non) candidate for president. But Nat should be warned: if a coalition including Prabowo does get hold of Bumi, it wouldn’t surprise me at all to see the King of Cooption try to bring his political rival back in to management.